“I am trying to get away. A world, far off, and nothing but my breath and the very next pedal stroke. 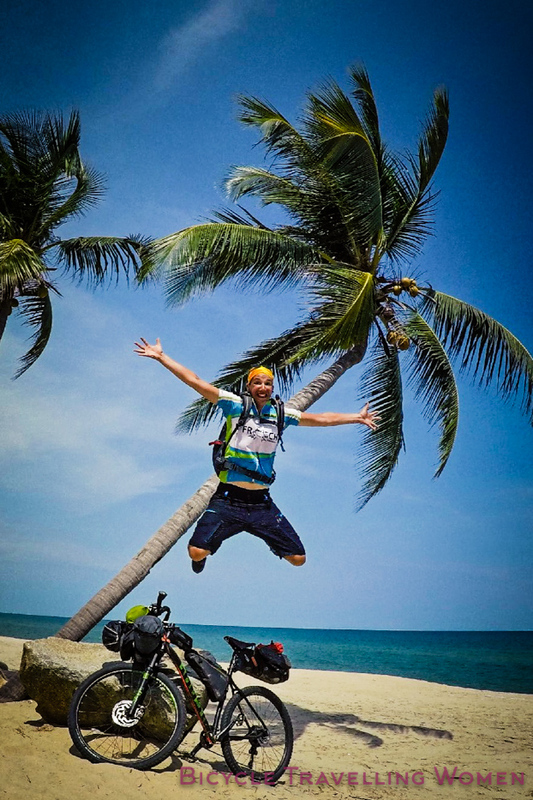 The feeling of conquering my own aliveness, with no task but to keep moving; making every way the right way.” is how Anna Kitlar, blogging at Bikexploring.de, describes setting off on her bicycle journey. 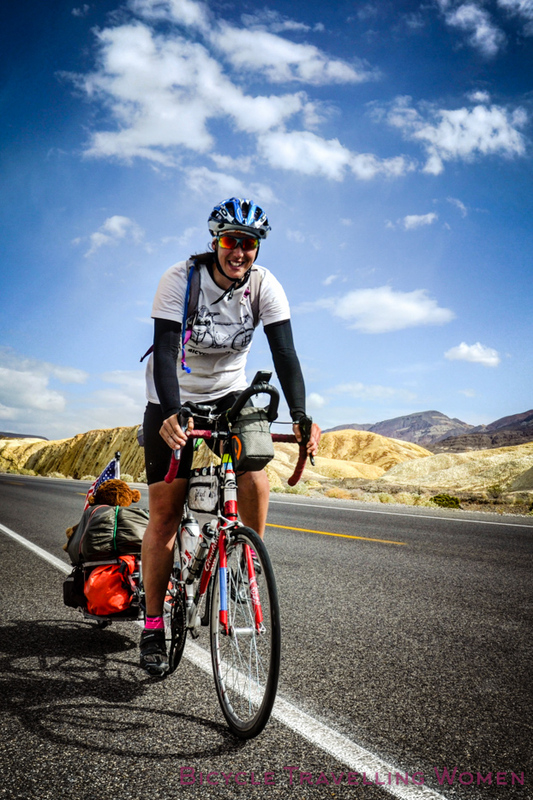 Through this interview we will learn more about her insights and how she travels by bike. 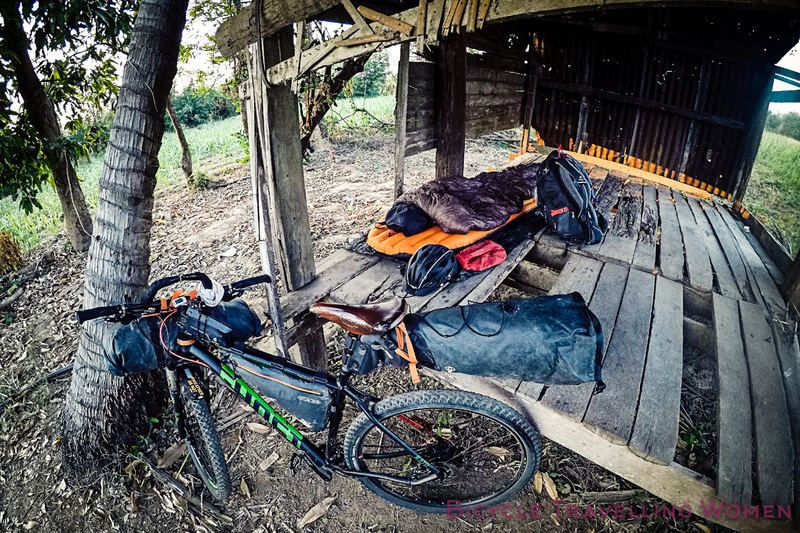 It is great to have a few sneaky insights into the life of a bikepacker! At the moment, if I understand correctly, you are cycling from Hong Kong to Greece. You have also previously cycled coast to coast in the U.S. How did you arrive in Hong Kong and why are you cycling this route? Thank you so much for letting me share some insights of my adventurous life on your platform. You are right, I am currently on a bikepacking journey from Hong Kong to Greece. On January 15th I took a flight from Hamburg (Germany) to Hong Kong. In Hong Kong, I stayed with a wonderful warmshowers host for a few days, until I set out to my first country: China. I don’t really know why I chose Hong Kong as a starting point. It kind of evolved over time and somehow it felt like the right place to get started. I work as a mountain bike guide for a German company in Greece at the moment. This translates into very convenient schedules for bicycle touring; season begins in April and runs through October. After spending some time at home with my family, I wanted to go on a bike adventure and cycle to work in Greece. However, it is too cold to cycle from Germany to Greece in the winter, so I began to look into other routes. Southeast Asia seemed like a good place to escape winter for a while, and the Pamir Highway as well as countries like Iran or Armenia have always fascinated me. I wanted to start in a place way out of my comfort zone, get thrown into complete chaos and slowly make my way back into the familiar. Why did you embark on this journey and what did you take away from it in terms of learning experiences? In the summers of 2015 and 2016 I solo cycled about 7000 km across the U.S – split up into two trips because of Visa problems. I had just graduated college in New York with a degree in International Studies, and, like most students, I didn’t really know what I wanted to be in life. I knew I didn’t want to go back home to Germany just yet so traveling felt like a good excuse to buy some time before having to make decisions. Back then, I didn’t know anything about bicycle touring, so I was looking at options to buy a cheap car and drive cross country. The U.S. was the first country I wanted to explore after graduation, because I couldn’t leave the country that was my home for four years without truly knowing it. I knew people in Germany and elsewhere were curious about my “insider knowledge” of the U.S. but all I could say was, “well New York, Florida, Colorado, and Phoenix are nice places.” That didn’t feel like a good representation of such a vast country. Driving cross country was way over my budget, so I started to look at other options. One day, I went out to a bar with a few friends for drinks after work, and I saw a picture of a guy on a loaded bike on my friend’s Instagram. I still don’t know if it was the beer speaking back then, but I knew in an instant that I wanted to bicycle coast to coast. The next day, after getting sober, I began to research bicycle touring, and a whole new world opened up in front of me. I had no idea that so many people travel on something as basic as a bicycle. I felt like a little child who visits a candy store for the first time, after having lived in a cave her whole life. Amazingly so, when I set out for my tour and left New York, every day started to feel like this. For the first time in my life, I felt truly alive. I think that’s the biggest thing I took away from that tour. Conquering your own aliveness by pushing every leg muscle into the pedals to keep the fully and way too heavily loaded bicycle moving forward is the most liberating feeling in the world. You learn to live in the moment, to enjoy every new smell, unusual tastes, diverse people, and different landscapes. Furthermore, I learned that there are no limits to what I can achieve if I set my mind to it. From gruelingly hot deserts to high mountains, every inch of the continent can be reached on my cheap $ 200 road bike. I stopped feeling scared of anything, my confidence increased tremendously, and I realized that people are kind, friendly and well-intended. 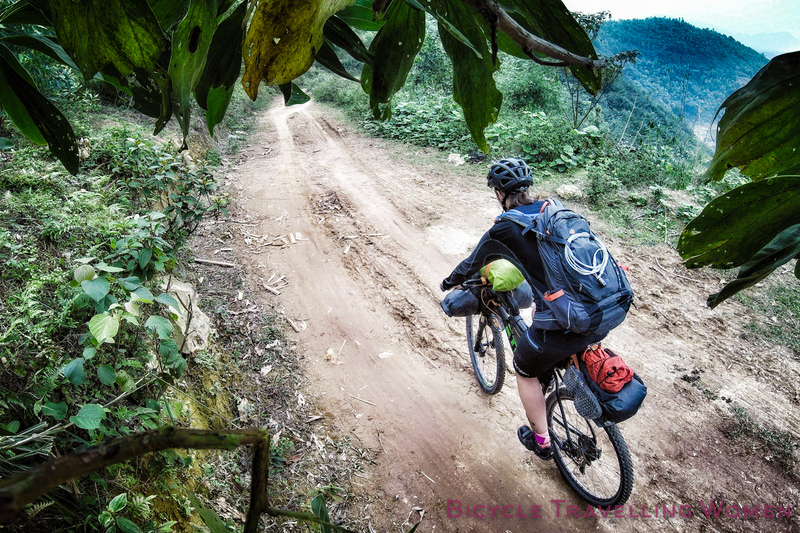 You mention on your website: “By traveling on a something as simple as a bicycle, I allow myself to wander off into the vast jungles of cultures, languages and religions. This often leads to me stumbling upon life-altering, new ways of thinking, living and being.” What new ways of thinking have you come across that you really appreciate and maybe also have implemented yourself? Often times, we are scared of the unknown, scared of people we don’t know because of stereotypes we build up in our subconscious mind. I started to embrace the unknown and get excited every time I got to learn more about different cultures in the U.S and later Southeast Asia. I stayed with Amish people, slept in churches as well as fire stations, I talked to gang-members, KKK people, religiously strict people in the bible belt, and many many homeless people. We are all humans and our differences are something we should cherish by learning from each other. In Asia, I slept at Mosques, churches, Buddhist and Hindu Temples as well as many homes of complete strangers. Especially around Vietnam, Laos, Malaysia and Kazakhstan I started to become a lot more observant due to the fact that most people there don’t speak English. On a bicycle you have to communicate with people. You rely on complete strangers for advice on directions, where to get water, which food to eat, and simply a nice conversation via Google Translate. You have to navigate this jungle of people who grew up very differently from you. In Asia, I learned two things that really stuck with my. First, I learned to be patient with people who come from a culture so different than anything I was used to. It is important to give people space to be themselves and to be patient when people give you wrong directions (trust me, it happens all the time in Asia). We need to exercise our diversity. Space to grow can only come from a place of patience, openness and kindness. Only then we may both give and receive ideas and learning experiences that leave a lasting impact. Secondly, I truly learned the meaning of family in Asia. It was amazing to see how entire communities come together as families by supporting and helping each other in difficult times. Conservative family values are still huge in almost all countries I cycled, and most families share one home with several generations. Grandparents take care of children while the parents are at work, and elderly people are highly respected. People get married at young ages, and divorce rates are considerably lower than in Europe and the U.S. While this doesn’t pressure me into getting married right away, I do like the way families hold a strong bond, and that’s definitely something I picked up in Asia. Have you always been a cyclist and enjoyed cycling? I got my first bike when I was four years old and off I went. My parents grounded me countless times because I would just bike off, and not listen when they told me to stop at intersections. It was definitely love at first sight, and I enjoyed cycling from a very young age. When I got older, I used the bike to get to and from school in Germany. After moving to the U.S. I eventually got a bike there, because I missed the freedom of biking to places without having to rely on public transportation. Cycling Asia is very different from cycling the US. How have you adapted? Do you do things different during this journey, compared to the previous one? Do you look differently at the goals you want to accomplish during this journey compared to the previous one? It was definitely difficult to adjust to the language barrier. Cycling in a country where nobody speaks your language makes even going to the grocery store to buy water an adventure. Imagine sitting at a Chinese street food place somewhere in a rural town and ordering dog meat by accident. Or, getting stuck at the border between Malaysia and Singapore because you entered military zone by accident. Asia has its own rules and there is no sense of feeling at home. 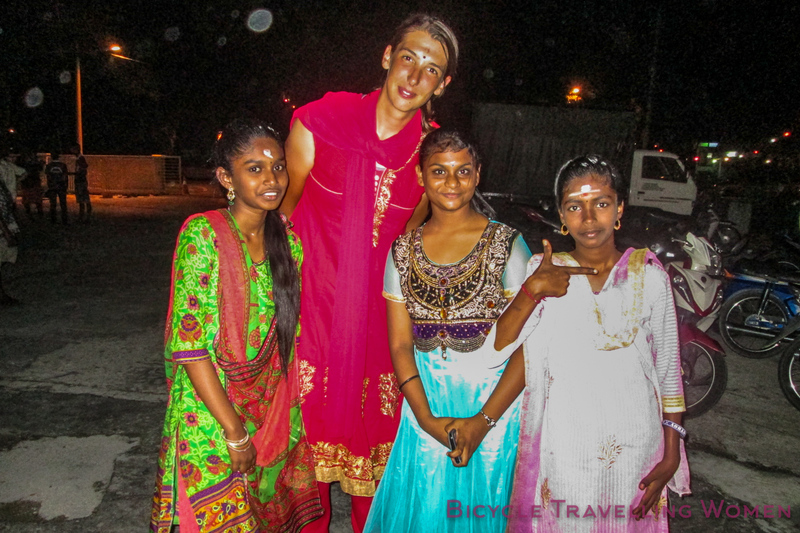 As a foreigner in rural areas, I quickly became the attraction for everyone. In the beginning it was funny how everyone stops to take selfies. However, after a few weeks it became annoying because most Asians don’t seem to get the idea of personal space. Yet, again, patience is key to deal with these moments. As for my goals, they are definitely not as self-centered as on previous tours. In the U.S., I tried to figure out who I wanted to be in life. I had a lot of thinking to do, and my goal was to get to know myself better. On this journey, I am looking to understand my place in the world. I want to learn about different people and their values. I want to know what makes Laos’ people laugh, and Chinese people cry. I try to understand why Malaysians don’t like to talk about politics, and what Kazakh people think about Russia. Moreover, I try to inspire people worldwide to follow their dreams. Women are capable of so much more than we think we are. Imagine the impression I make on a young girl in rural Asia when she sees me, a fellow woman, traveling solo by bicycle. If I can only inspire one girl to go out and follow her heart it was all worth it. Why did you choose for the bikepacking set-up? Have you had to make any important gear choices (take one thing and not another)? Do you carry enough clothing/gear for winter circumstances? Can you tell a bit more about how it all works as a bike packer? 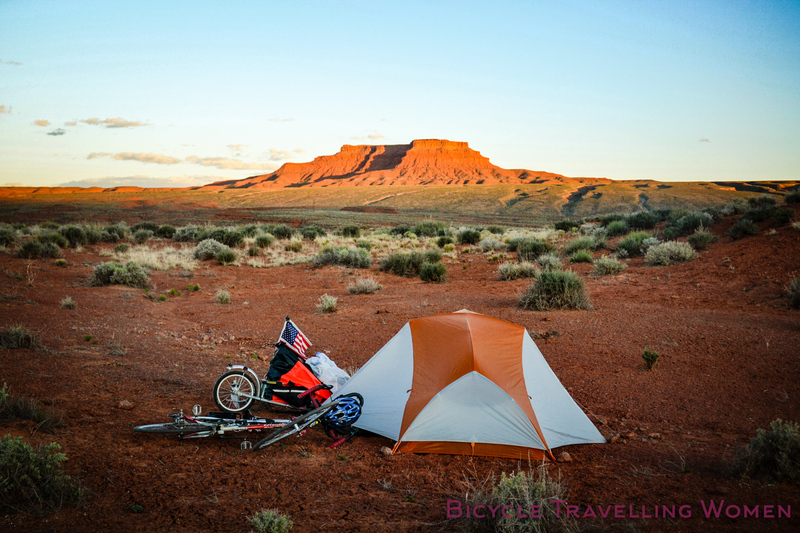 Bikepacking, it seems like, is the new craze in the cycling community. For those who don’t know what it is, there is no strict definition really. According to Ortlieb’s website, “Bikepacking is an outdoor adventure that starts where bike touring stops: at the end of paved roads. If you want to feel simultaneously free and at home in nature, the combination of biking and sleeping outdoors is just the thing for you. 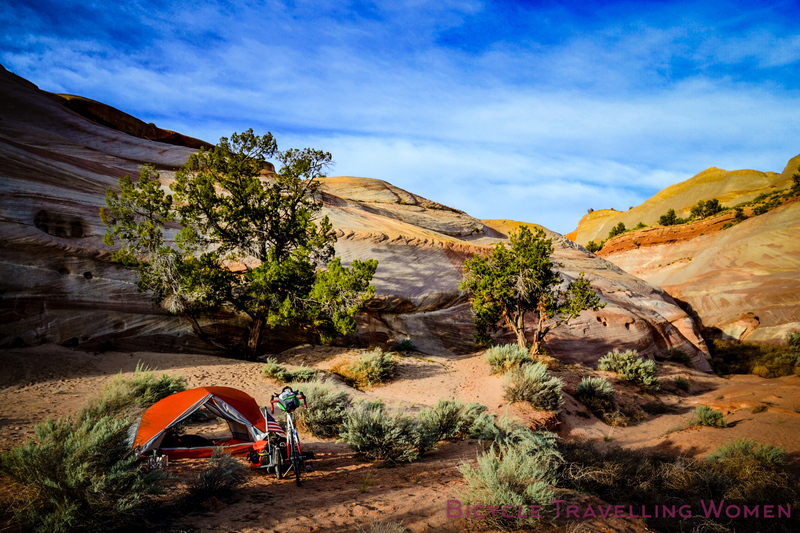 What you need: a gravel grinder, a mountain bike or fatbike, a thirst for adventure, and light baggage.” When I crossed the U.S. I was heavily over packed. I hauled a trailer and way too much stuff that was unnecessary but made my travels slow and comfortable. Having just graduated from college, I didn’t have the money to invest in expensive, lightweight gear. Also, I had no idea about bike touring in general. When I prepared for this tour, I made many changes to my gear, which shows that I underwent a huge learning process. I have less clothes and lighter gear. Most things have several functions, and I don’t carry anything that I don’t use at least once every three days. In Southeast Asia, I didn’t carry a stove because food was available everywhere. I only just added a lightweight alcohol-based stove for the section in Central Asia, since it is still cold here and way more remote. I carry winter clothes and a very warm sleeping bag. My tent is only a three-season tent, so we will see if I made a good choice when I hit the mountains. When I packed, I literally sat down for hours and debated for every item if it was necessary to bring. I think bikepacking teaches you to be content with less stuff even more profoundly than bike touring. We don’t need a lot of things to be happy and survive even the roughest terrains. There is no right way to bikepack but I certainly favor the most minimal setup I can get away with. I already started thinking about ways to make my next setup even more lightweight. However, this should not get to a point where comfort is compromised to the extent that I don’t enjoy myself anymore. A big difference to bike touring set-ups is the fact that I chose to carry a backpack. I am used to carry heavy backpacks from my job as a mountain bike guide, so the transition was minimal. However, this is definitely something that might not be comfortable for everyone. Many bikepackers choose not to wear a backpack and they are perfectly fine. 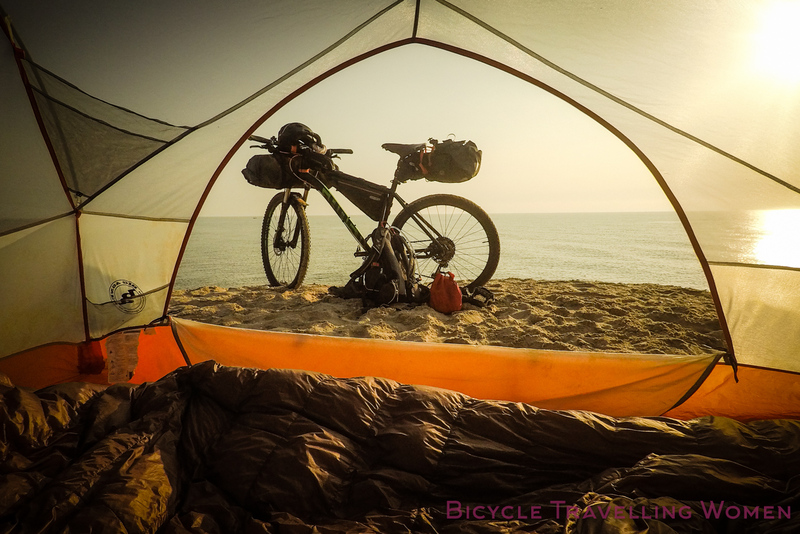 Bikepacking around the world is definitely not easy, and most people that bikepack stay on local trips with less climate zones and terrains to worry about. However, I found a set-up that works great for me and haven’t looked back. What is your favorite food while bicycle touring? What do you eat for breakfast, lunch and dinner? Snacks? Do you cook yourself? Different favorite in every country? Snickers and ice-cream make my wheel go round. I love ice-cream and will often reward myself with one, especially on hot days. Snickers are my go to food on mountain passes. I am yet to find a country that doesn’t sell them. Nothing beats climbing a mountain, making it to the top, and eating a Snickers bar while enjoying the view. They even still taste great when melted. Other than those two, I eat a lot of nuts and fresh fruit. I don’t think I can ever enjoy fruit in Europe again, after eating truly fresh oranges, mangoes or melons in Asia. In the U.S. I lived off of peanut butter and freeze-dried food. I carried a stove and cooked many delicious meals. In Southeast Asia, I ate whatever street food people were selling, hoping I wouldn’t get food poisoning. Seven-eleven sold great sandwiches, and I loved to get their chocolate milk. In Vietnam, the French influence was great for baguette and Thailand had amazing Pad Thai. I loved to get Indian food in Malaysia, especially naan bread and curry for breakfast. My range of food definitely expanded on this trip, and I am not as scared of foreign food as I used to be. In Central Asia, I am back at cooking my own meals. I like to cook pasta or rice with sauce. Eggs are also a great meal, and I love to make tea and cook soup to stay warm. Furthermore, I eat bread with cheese a lot. Especially now that it’s still cold, cheese lasts forever and it is a great source of protein and calories. Nuts are also always in my bag and I love to snack on cookies during the day. As for drinking, I use a filter to get water from rivers and lakes. I am not a big alcohol person but I do enjoy a cold beer every now and then. Pepsi is my biggest addiction and I am working hard to beat it. Now that I am in Central Asia, fresh milk and sparkling water are not only available everywhere but also affordable – this means I am one happy cyclist. How do you choose your routes? Are you more focused on single trail sections because of the set-up? How easy is it to find nice tracks? I don’t really plan exactly where I go for each day. Having a rough idea which countries I want to cross is all the planning I did before setting out. A lot of times, I only plan ahead for the next two or three days. I try to take dirt roads and single trails whenever I can find them. Maps.me is a great map that helps me navigate offline. However, most small tracks are not on any navigation apps, so I also screenshot satellite images whenever I have WiFi. Talking to locals also helps to find trails that lead me off the beaten path. When I take paved roads, I try to stay on small local roads to avoid traffic as much as possible. Nevertheless, sometimes there is no way around big highways. I find it relatively easy to find nice tracks because I don’t mind detours and dead ends. Going off-road is almost always an adventure, especially when trails are not marked on any maps. It is also more dangerous though, and I advice anyone traveling alone to take precautionary measures to stay safe. I know how to repair my bike, I can survive several days without any help, and I always carry a satellite phone from which I send out my location on a regular basis. Adventure is great and it brings a lot of freedom, yet it is important to understand that the universe doesn’t care too much if you are alive. Nature can be unpredictable, so it absolutely necessary to study the dangers of each areas before entering. What are the most enjoyable moments during your journey? There are many moments that I enjoy during my journey; mostly those moments that make me feel alive. Getting to the top of a mountain, going downhill, finding a great single-trail, waking up in my tent next to the ocean, meeting locals, eating great food, and many more. However, the greatest feeling for me is riding in the middle of nowhere, surrounded only by vast, empty space. I set out to escape the ordinary. To me, this blank, unknown place in the map is the most valuable place. The wilderness needs my whole attention. It’s a rough place of unpolished truth. You are what you are right there and then; no hiding or pretending. Even in the roughest place, nature’s peace will fill my soul with happiness. When I cycled across the U.S. I made my way through the Navajo Indian Reservation. By engaging with native Americans, I learned many interesting theories on living in harmony with nature that I have since adopted. They love their land and are very attached to it through everything they do on a daily basis. In short, they base their way of life on the belief that everything on earth is alive and their relative. Hence, they worship the sun, winds, and watercourses. Even in the biggest desert, there is so much life. Connecting with nature in a way similar to the Navajos are probably my most enjoyable moments. What makes you sad while traveling by bicycle? When I first started traveling on a bicycle, I thought I could get away from all the bad news in world politics. After all, I am usually without internet, and it is difficult to watch or read the news every day. However, I soon realized I am more than ever confronted with the harsh reality that millions of people live in. Water shortages in the U.S., racism, hunger, child labor, poverty, gender inequality, child marriage, religious freedom, corruption, homophobia, the destruction of our environment, and so much more. Except, all of this is not an abstract news story but the life of people I meet on my journey. It is impossible to travel like this and not feel sad and helpless at times. Empathy is very real, and with it comes a greater sense of responsibility for our planet and all its inhabitants. On your website you write quite strong that ‘the feeling of conquering my own aliveness’ is important for you. Can you tell us more about this and your thoughts? I think I touched on this before, and it has a lot to do with mindfulness. I am not saying bike touring is yoga – Buddha forbid. However, traveling on my bicycle got me to a place where I feel alive every single day. I think humans are meant to live a nomadic life-style. We are not meant to stay in one place. Yet, we built up anti-human constructs in our modern society that prevent us from being truly alive. Many people merely exist. They work a job they don’t like, and to distract them from their unhappiness, they consume and buy more and more stuff. I am not trying to say everyone who doesn’t bike tour is unhappy. Mindfulness or aliveness can be achieved in many different ways. However, many people I speak with, including my former self, behave this way. Practicing mindfulness is not always easy. It forces you to focus your awareness on the present moment, while calmly acknowledging and accepting everything that comes with it; joy and sadness, pain and happiness. That’s why I describe it as ‘conquering,’ because getting there requires constant work against those anti-human constructs which are so deeply rooted in our society. Just yesterday, I was sitting on my bike and beating myself up, wishing I had acted differently in a moment two days prior. I played the scene over and over again in my head, berating myself and obsessing over every detail. Negative self-talk is exhausting, mindfulness and conquering my aliveness helps to get to a better mental state. Another example is the fact that I often catch myself romanticizing the future. I think about the Pepsi at the next gas station or the chocolate I can buy when I get to the next town. I plan out my arrival in Greece over and over in my head, but by doing so, I rob myself of my current experience. How and where do you sleep? How do you manage to find a place to sleep every day? My tent is my home most days. I love being outside and waking up to the sound of nature. For that reason, I stealth camp most days, and usually don’t have any problems finding good places to sleep at. In bigger cities, I often use couchsurfing, warmshowers or I stay at cheap hostels. Many times, strangers have invited me to stay with them, and I usually trust my instincts in those moments. I also stayed at fire stations, religious places of worship, police stations, stores, gas stations, ferry terminals, airports, restaurants, and libraries. By now, I really don’t plan ahead where I will stay, and in my three years traveling by bike, I always ended up finding a good spot for the night. What does your perfect day look like? And do you have one that comes to mind? A perfect day is sunny and 20 °C, beautiful scenery, great food and a nice disperse camp spot at night. At least that’s what I dream of while it is raining and cold in Kyrgyzstan. When I was cycling in Southeast Asia, most days were incredibly hot, and I thought some colder days would be perfect right now. Often times we want what we cannot have, especially when traveling on a bicycle. For me, any day I get to spend doing what I love is perfect. I always like to say: A bad day on the bicycle is still better than a good day anywhere else. When I have a flat tyre, when Visa issues come up, or when things don’t go as planned I get frustrated. Everyone does. Nonetheless, I remind myself that these obstacles are the foundation of this adventure. It is the not-so-perfect days that leave a lasting impression. The day I got stuck in a thunderstorm on one of Colorado’s highest peaks, or, the day the high tide surprised me while camping on the beach in Thailand. Everyday is a grand adventure. Perfection lies in the absence of routine. So as long as no two days are the same, happiness can be found in the most challenging moments. Which people during your journey have made the most profound impression on you? How do you deal with cultural differences? Can you give any examples? One example that comes to my mind is spending Têt (Vietnamese New Year) with a family in rural Vietnam. I had just crossed into the country and did not realize that there was a holiday during that time. After crossing the border, I took the first dirt road I could find to get away from the main roads. Not long into my day, I was stopped by a local who invited me in for some tea. Fast forward, I ended up staying for three nights, and really getting an amazing cultural experience. We sang karaoke, cooked food together, tried communicating via Google Translate, and exchanged cultural values and ideas. Local women showed me how they wash clothes by hand, and I showed them my camping gear and how the tent works. The boys tried riding my bicycle, and two animals were slaughtered in front of me to celebrate my attendance. It was amazing to see how these people live without our idea of a kitchen, bathroom or washing machine. They cook over open fire, have a big bin of (cold) water to shower, and wash everything by hand. Yet, they were happy and content with what they had: a family bond that is inspiring. It’s those people that barely get by who make a lasting impression on me, because I learned that often times they are the kindest and most giving humans. With possession comes greed and jealousy. Whereas low-income people who we like to call poor are rich in happiness – something we will never buy with money. I think the question should be “how do you deal with people?” I have gotten so used to being alone that ‘coming back’ is more of a struggle by now. On the bike, I listen to music a lot to make things fun, especially on long stretches of boring roads. There is a great sense of peacefulness found in loneliness. Once I realized how liberating traveling alone is, I never looked back. I can do whatever I want, and don’t have to compromise my experience. Of course sometimes I think it would be nice to share some moments with other people, but those thoughts are rare. Furthermore, especially when I travel on popular bike touring routes, I am never truly alone. 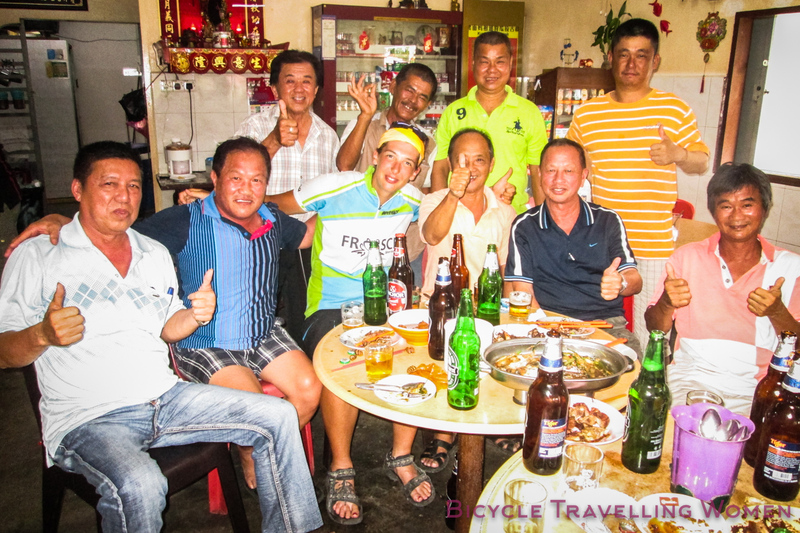 There are always opportunities to share some time with other travelers or engage with locals. Most times, I get so overwhelmed with people around me everywhere that I literally start longing for some solitude. I must admit though, it would be nice to have a traveling partner to take pictures sometimes … (I hope everyone gets this is a joke). 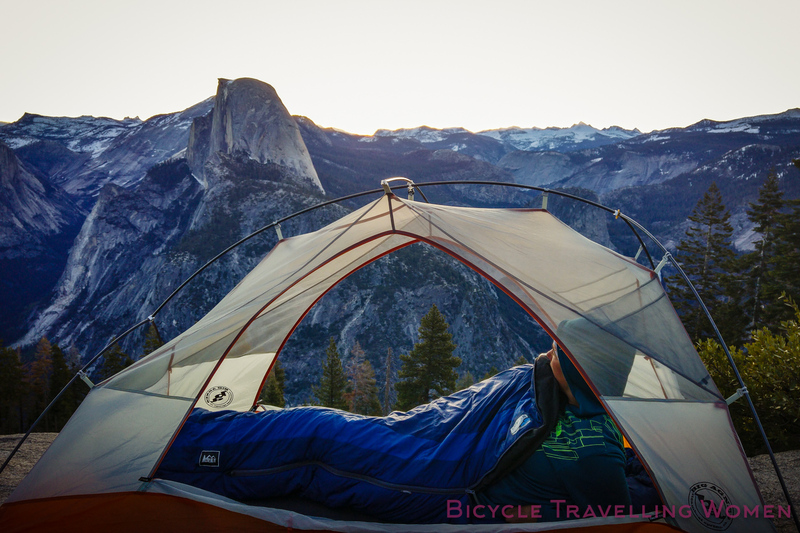 Do you have personal rules or values you stick to while bicycle touring? That’s a difficult question, because I never really thought about it. One thing that comes to my mind is that I try my best to be judgment-free and and without prejudice, especially when I meet people who share different values and ideas than I do. That’s not always easy but incredibly important in my attempt to understand our human world in its whole diversity. Furthermore, I try not to but I am incredibly competitive. On days when I cycle, I somehow have this rule in my mind that I can never cycle less than 50 km. It’s so weird and I don’t know where that number comes from. Somehow I believe less than 50 km is a wasted day. As for this tour, I am yet to break this self-imposed rule. How do you handle female hygiene? That’s an important topic, because hygiene is very important on an extended tour like this one. In rural parts of many countries it is difficult to maintain a good female hygiene. Getting used to squat toilets and peeing/pooping outside is sometimes a challenge for women, and it prevents them from setting out. I found that I can, by now, clean myself almost anywhere as long as there is clean water. I have washed my body and hair in public restrooms and taken baths in rivers and lakes. Moreover, I carry wet-wipes to clean myself up when I am camping and water is scarce. Especially during the period, hygiene is very important and wet-wipes that disinfect and moisturize keep me healthy. I also swear by a menstrual cup instead of using pads or tampons. It is so much cleaner, care-free, and also a lot cheaper as well as better for the environment. Of course there are moments during my period, where I don’t feel well, and I struggle to enjoy myself. If I can, I will usually take a rest day then, find some comfort food and let my body relax. Deodorant is also an interesting topic. I carry it and use it when I am around towns with locals. However, I stopped using it when I am alone in the mountains and found that the less I use deodorant, the healthier and cleaner I feel. One thing I would never set out without is hand-sanitizer to stay clean and healthy. During a long tour like this, it is easy to lose a certain sense of hygiene. You roughen-up and at one point it doesn’t matter if you haven’t washed your hair in four or five days. My longest time without a proper shower is easily ten days – I survived and was just fine… though I am not sure about the first humans I encountered after those ten days. My point is, it is important to stay healthy because otherwise a tour can be over quickly. Yet, I think it is impossible to keep the same sense of hygiene that we would at home. Do you do anything different because you are a woman? Traveling for so long taught me that traveling alone as a female has a distinct advantage: people trust me and they think I am vulnerable. Therefore, especially fellow women will try their hardest to protect me from any danger in their respective country. I’ve been adopted into so many loving families that it feels like I have people I call family in almost every country. However, at the same time, many people pity me for having to travel alone. Depending on the culture, they wonder why I am not married with at least three children. At the same time, especially other local women I meet idolize me for breaking out of a male-dominated society that tells women we shouldn’t venture out alone. That’s sometimes overwhelming. Also, in some cultures, you have to follow specific rules as a woman as a way of showing respect. In Iran, I have to wear a hijab and long-sleeved tops as well as pants. I have to cover my shoulders and knees to visit Buddhist temples or Orthodox churches. I cannot touch or sit next to a Monk in Laos. There are many unspoken rules in this world, especially for women, and in order to be culturally sensitive, it is important to follow them. 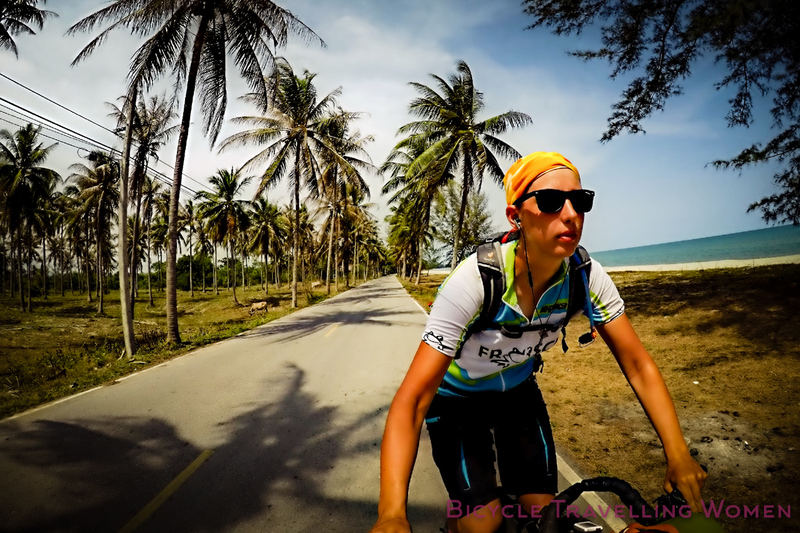 As a solo female traveler on a bicycle you stick out of the crowd, which leads to a lot of unwanted attention. I have gotten countless marriage proposals in many different countries and people take pictures of me all the time. Many men will try to make conversation and it gets really tiring to be the center of attention wherever I go. However, I never felt unsafe traveling alone as I simply learned to trust my instincts. I don’t think societal ideas of how women ought live or travel should stop us from traveling. Maybe we can even change some of those mindsets, one female traveler at a time. Would you encourage others to a embark on a similar journey to your own? Most definitely!! Get out, find the end of your comfort zone, and kindly crush any self-imposed or societal limits that hold you back from following your dreams. You don’t have to set out and break any records. I think it is important to ease into the adventure and start venturing out step-by-step. Also, bikepacking or bike touring might not be for everyone, and that’s okay. It’s a challenging way to travel and it can, at times, be dangerous. I think it is important to understand the dangers of exposing yourself on something as vulnerable as a bicycle. Yet, if we hide in our save world that holds a comfortable but boring life, we will never find out what we are truly capable of doing. Anything outside your comfort zone will lead you to life-altering experiences. For some, that’s taking a train alone to the next bigger city; I applaud you for having the courage to step out into the unknown. For others, it’s crossing Antarctica on a self-supported tour, and that’s great also. If we don’t do something every now and then, thinking, “what am I actually doing here?” we are not living wholeheartedly. In short, do it. If you find out traveling by bicycle or stepping out of your comfort zone is not for you, that’s not something to be ashamed of. I would hate to grow old realizing I only lived a life full of regrets, because I always thought ‘what if’ instead of going out and actually following my heart. What would you tell other women who are thinking about the idea of heading out on travel by bicycle? What would your practical advice be to them? What would you have wanted to know before setting off on your journey? There is so much advice I have it would easily fill two books. I always thought of if I were to do my first tour all over, I would pack less and learn how to repair my bike before setting out. Nevertheless, I came to realize that there is a learning curve involved in bike touring that requires you to mess up – all the time. Don’t get discouraged if things seem difficult or impossible at first. When you believe in yourself, anything is possible. After overcoming initial obstacles, you will come out stronger and more prepared for future challenges. 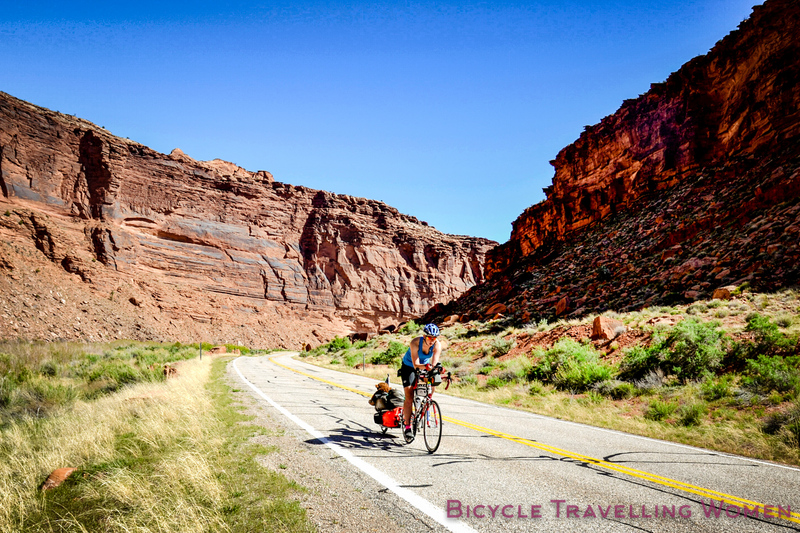 Bicycle touring is not easy but the struggles are worthwhile. Also, after announcing your big plans to friends, family and co-workers, there will be a lot of doubters in your life, who tell you it is too dangerous to head out and travel by bicycle. This gets annoying and after some time it might even get into your head. My advice, tell them you understand their concern but at the same time, explain why it is important to you to head out for your journey. It is absolutely normal for parents to be scared but don’t let that dictate your decision making process. Lastly, I strongly advise everyone to read travel blogs of other cycle tourists to find out more information and understand that there are many different ways to travel by bicycle. However, don’t compare yourself to other cyclists too much. If you are slower or if you carry more gear than that’s okay as long as you create a meaningful experience for yourself. Eat lots of ice-cream, do what feels right for you and have the time of your life. What are you waiting for?